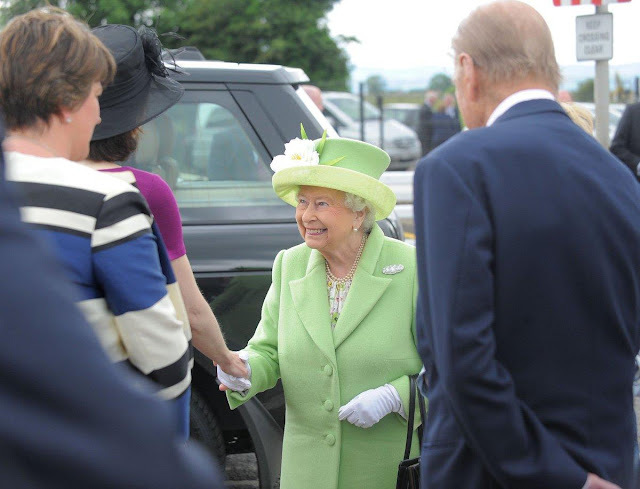 The Queen and The Duke of Edinburgh visited the Giant's Causeway, unveiled a statue to Victoria Cross recipient Robert Quigg in Bushmills, attended a reception at Portrush Golf Club, took a steam train ride, and officially opened a new train station at Bellarena on the last day of their visit to Northern Ireland. Two days and two brooches, both on their second appearances! This is a much clearer look at the Triple Diamond Bar Brooch than we got at its first appearance in 2014, and you can really see just how large these diamonds are. A simple design, but a staggering carat weight.